Hope everyone had a wonderful holiday season! We have been super busy at the store, so I haven't had much time for crafting and now we are doing inventory!!! I did buy myself some new stamps for Christmas and I have been doing a bit of coloring. All the stamps I bought are from Kindred Stamps and I can't wait to get some projects made from these. 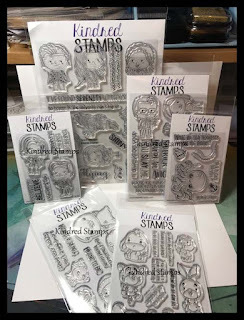 I just love all of their stamps, I have well over a dozen stamps sets and probably 30 more on my wish list. Plus I got all these awesome stamp sets! Here are some of the characters I had before and I have made a few cards with some of these. I will post a few of them another day! 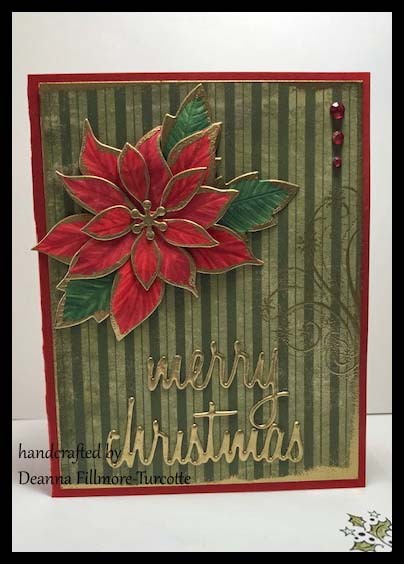 I had so much fun making this poinsettia card that I decided to make another! I changed it up a bit this time and added even more gold embossing!!! 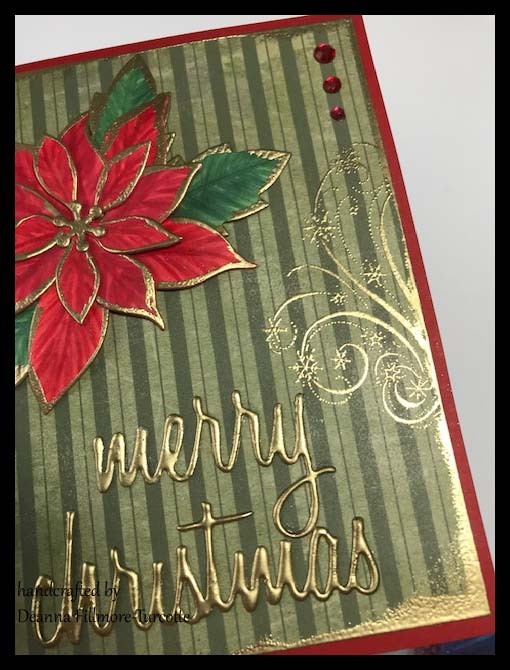 Can you ever have too much gold embossing...LOLS! 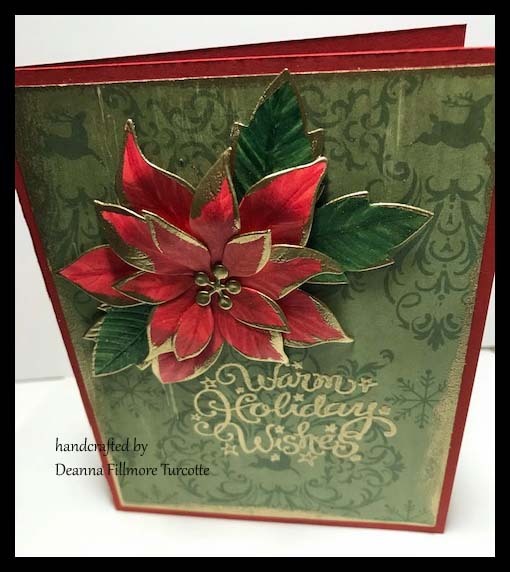 This one is for the Simon Says Stamp Monday Challenge "Warm Winter Wishes"
I used all the same items to create the poinsettia, I just changed up everything else! When I first put the card together it didn't have the gold embossed design on the side! The card seemed to be missing some detail so I added it at the end. I think it just needed that added detail to complete it. 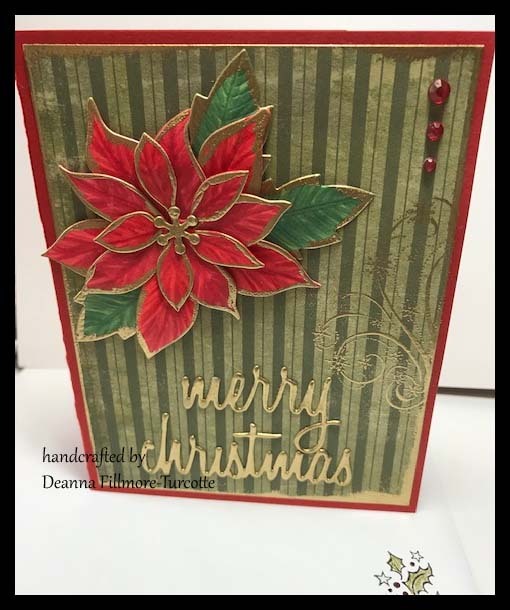 The greeting was die cut using the Sizzix Tim Holtz Alterations Holiday Word Script dies and then I embossed it with Simon Says Stamp Ultra Fine Gold embossing powder. Products used for this project! I think that's all the important details for this card. 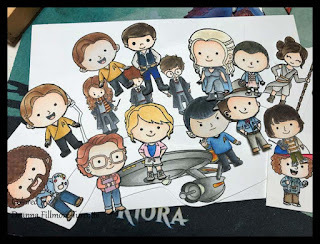 Thanks for stopping by & happy crafting everyone! I had another image almost ready for another card and actually managed to finish it tonight. 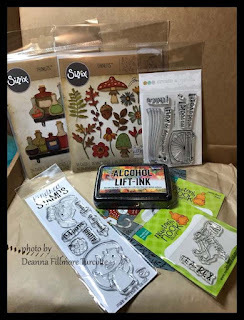 So I can enter it for the Simon Says Stamp Wednesday Challenge "Anything Goes". 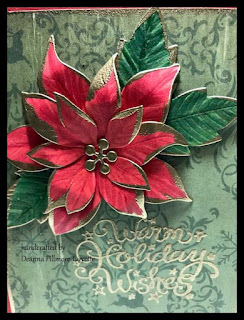 The great part is the image & greeting are both from a Wild Rose Studios stamp set, which is the product they are showcasing this week. The stamp set is called Winter Cottages, I stamped the image with Simon Says Intense Black Ink & colored the image with Prismacolor Premier pencils! This isn't the world's greatest picture, but it's late & I want to go to sleep, LOLS! Almost forgot to post this for the Anything Goes on the Simon Says Stamp Wednesday Challenge. 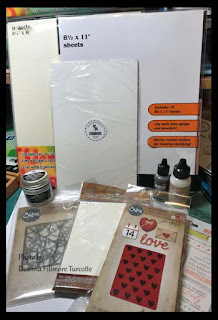 I have been busy doing the Daily Marker 30 day challenge and making lots of pieces for cards. 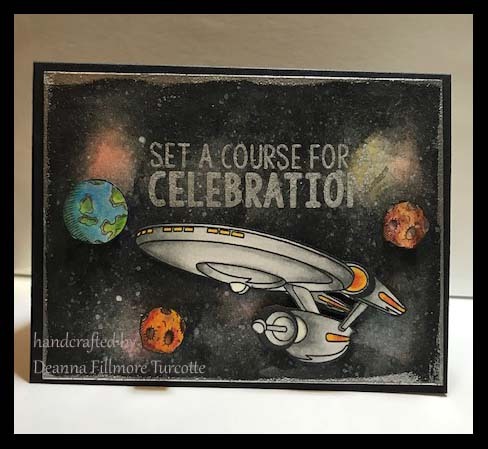 When I checked what the new challenge was last week I decided to put together some of the pieces for another Star Trek themed card. I posted it on my Instagram for another challenge and forgot to tag it for the Simon Says Challenge as well. So here we are with my post from Instagram with a few more details! I made the galaxy background with distress inks, shimmer watercolor paint & Copic opaque white paint for the stars. I edged it with Silver embossing powder by Ranger, also did the same for the greeting! I can't wait to get some of my planned projects under way! Guess that's all for tonight, thanks for stopping by! Well this challenge was perfect timing! 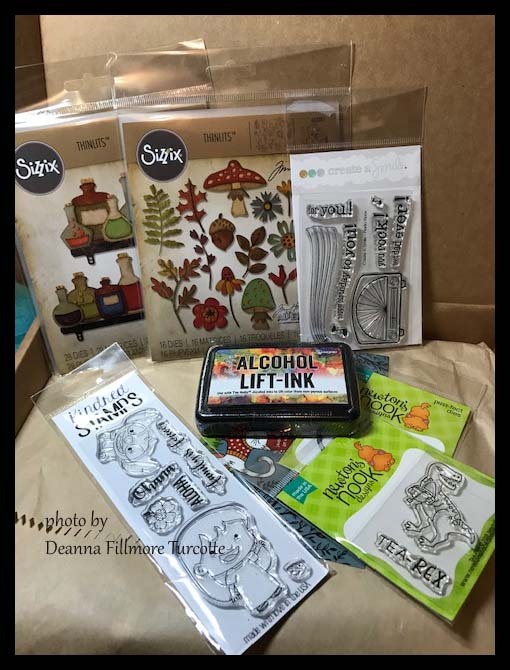 I ordered a stamp set from Simon Says Stamp back in September & I finally got it last week! 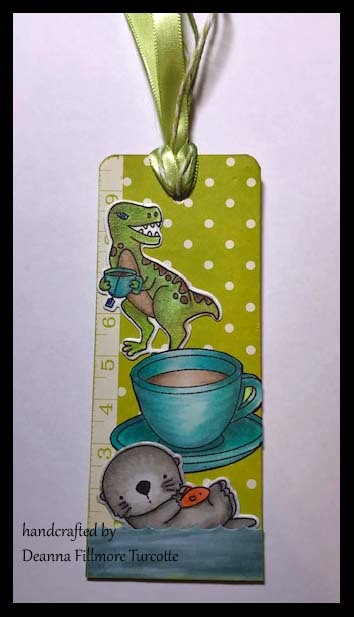 This is the bookmark I made for the Simon Says Stamp Monday Challenge for this week. This bookmark might not make any sense to anyone else, but trust me the person I made it for will love it! It is a combination of a bunch of her favorite things. I'm even tempted to add a little more to the back, which is just covered with patterned paper at the moment. I made the pieces at different times, I was waiting for the Newton's Nook TeaRex stamp to arrive to complete this project. I will add a list of supplies used tomorrow. I have to find the rest of the info hidden somewhere in my craft studio, this could take a while LOLS. Oh and in case you were wondering, here are all the goodies that I got in my order! The mail has been on rotating strike here and this order & Kit got mailed out on the 18th of October & I finally got it on the 27th of November! I can't wait to make some other stuff with all these great new products! 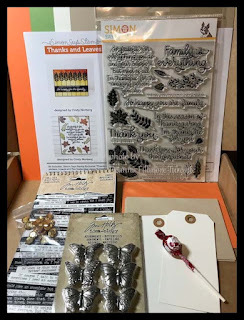 I had to pass on the December card kit, I figured it wouldn't make it here until January (and I'm sad because it was filled with some fantastic goodies). Well actually it's really rainy today! 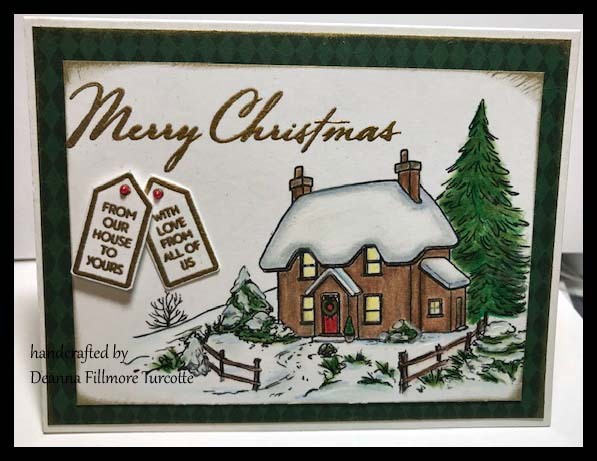 However, the challenge this week over at the Simon Says Stamp Wednesday Challenge Blog is "Baby It's Cold Outside" and I decided to use a piece I did for the Daily Marker 30 day coloring challenge to create a card. 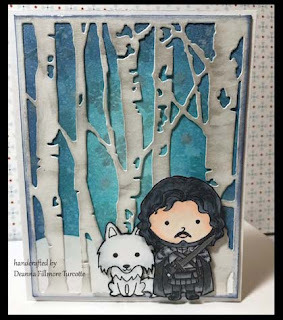 I also had to color a background & companion piece for this Jon Snow. Too bad I don't have a "winter is coming" stamp 😊. Anyhow I used some distress inks to create the back panel then stamped it with snow flakes & clear embossed them. After that I decided to use a star stamp and perfect pearls to add more frosty look to it. It was really hard to get a good picture of it. The birch tree die cut piece is also covered with perfect pearls. 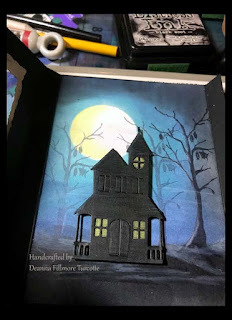 I distressed the trees a bit with some grey ink chalk ink & Faber Castell Iced coffee gelatos, I also decided to use the perfect pearls on the trees (doesn't show up well in the picture). 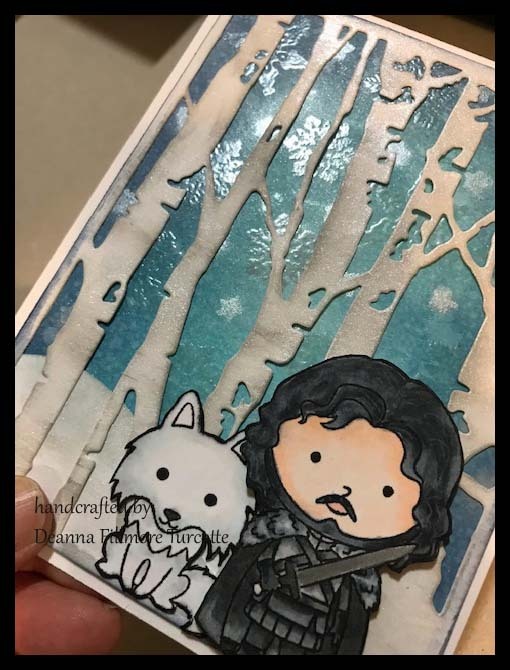 I colored Jon & Ghost with copic markers, fussy cut them out and then edged them with black ink to make sure they didn't have any rough edges. Ghost is glued directly on the card and Jon is popped up with foam squares. Stamps - Kindred Stamps "Heirs to the Throne"
I think that is all the vital information about the card, LOLS! I had lots of fun making this one. Finally got some time to spend in my craft room tonight and managed to finish a project for the Simon Says Stamp Monday Challenge "Let It Snow"
I'm just going to pop the pictures and links up here for tonight and add the other info tomorrow. I love this Stampendous Snow Postcard stamp and I make at least one card every year with it! I always have so much fun coming up with a new way to color it. 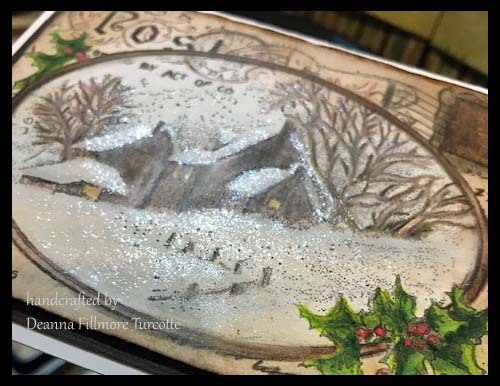 This year I used Prismacolor Premier pencils, tonic nuvo glitter gloss pen & some distress inks. Hard to get a good picture of the glitter on the snow but I tried! It really sparkles in person! So many projects to create & post, so little time. 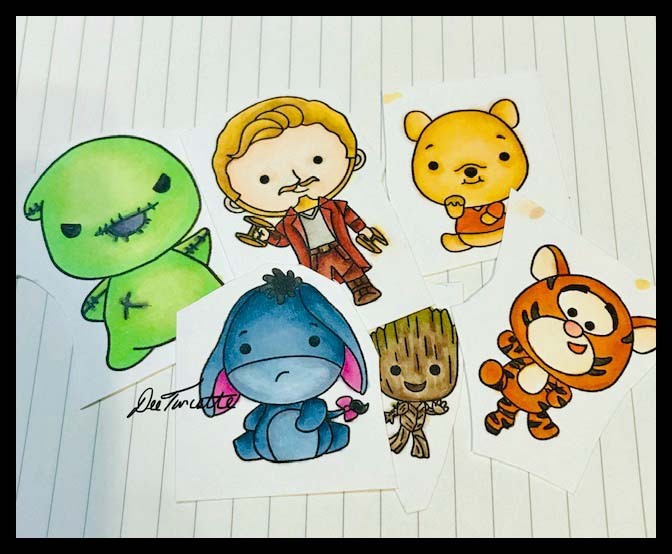 So I did update my blog post from yesterday and then decided to do another challenge. I went over to the Simon Says Stamp Wednesday Challenge blog and their challenge this week is gold! Well that seemed like fun and I had a great idea for a card. 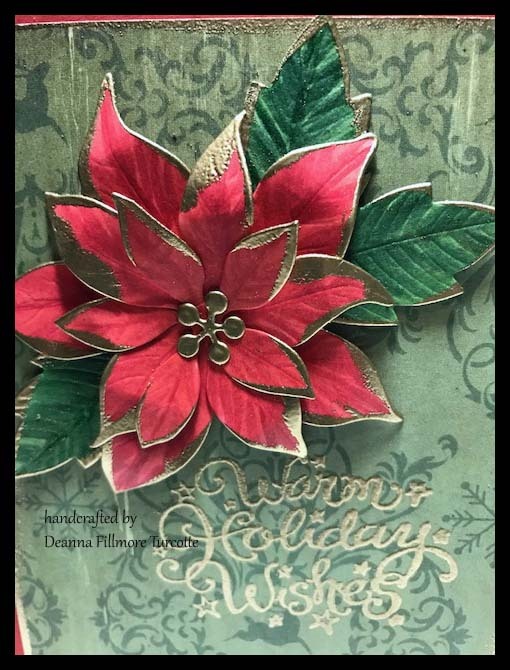 I think it turned out OK and I had a lot of fun embossing everything. 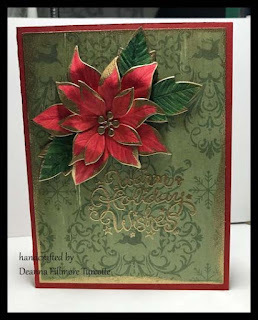 I started by cutting out the Poinsettia with the Poppy Stamps Blooming Poinsettia die & Neenah smooth solar white 110lb paper and then colored all the pieces with copic markers(R22, R24, R27, R29, G24, G28 & G29). I attached the poinsettia to the card with Nuvo deluxe adhesive and once it dried I curled the petals up a bit to give it some dimension. I also decided to redo my craft studio (mainly desk area) today, I will be back in a few days to post the pictures of how it turned out. 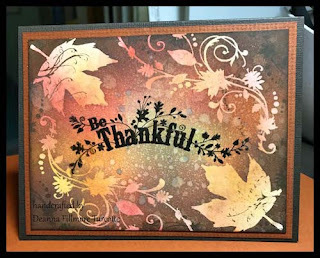 Well I didn't get to do the challenges last week, I did manage to get one done for this week The challenge this week over at the Simon Says Stamp Monday Challenge blog is Thanks/Thanksgiving! I know it I am thankful everyday for so many things, too many to list! I think it is important to stop and be grateful for all that we have not just at Thanksgiving, but everyday! 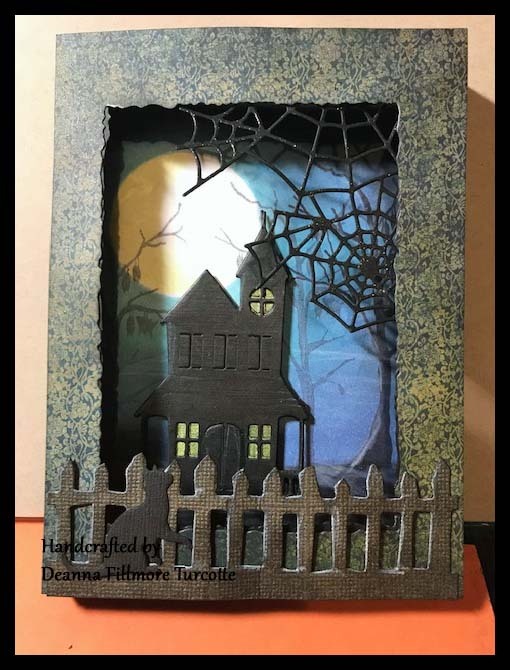 I am going to post the pictures for this challenge tonight and then add the details for the card tomorrow. To start I inked some wild honey & fired brick distress ink on a piece of Neenah smooth solar white card stock. I used an old Inkadinkado stamp set & versa mark ink to stamp the leaves & coated it with clear detail embossing powder. After I heat set the powder I continued using inks (distress inks - fired brick, wild honey, vintage photo, walnut stain, distress oxide inks peeled paint & walnut stain) to create this colorful background. I can't resist doing the water splatter technique (did a little too much - so I had to ink it up some more). I then stamped more of the leaf scroll around the edge of the paper and the greeting with MFT Hybrid ink Hot Fudge. 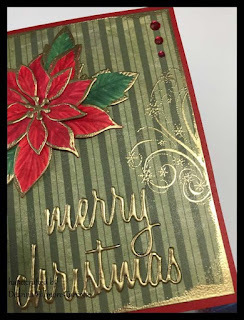 I decided the greeting didn't stand out enough so I put it back in the Misti and stamped it again with versa mark and used embossing powder on it as well. 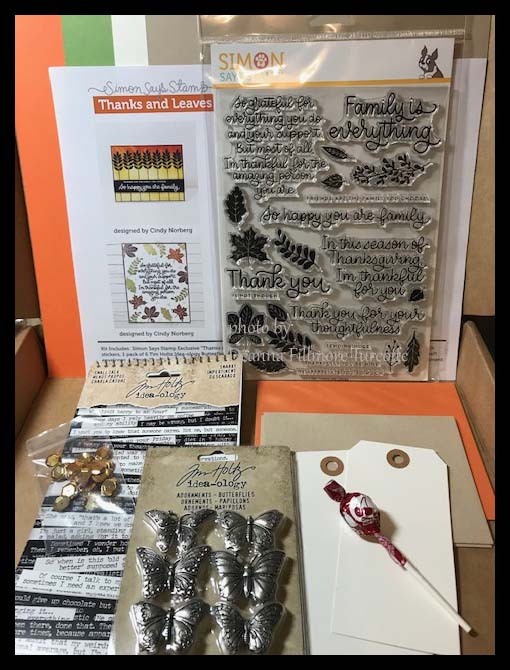 The two Inkadinkado stamp sets I used are Fall Season & Harvest Expressions. I'm really happy with how the card turned out. 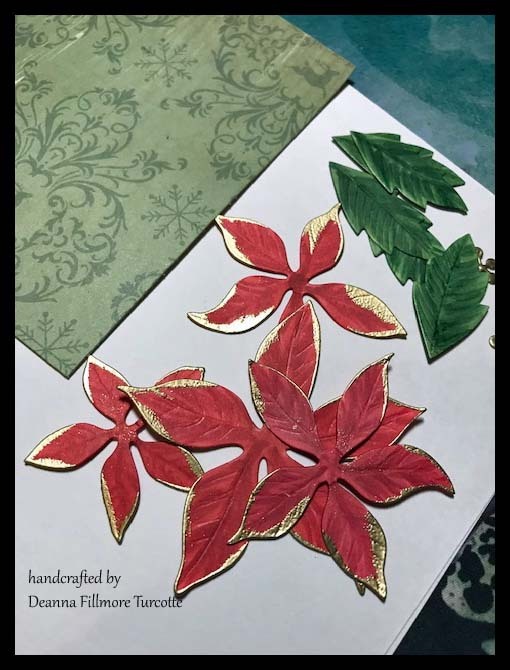 I will probably try this technique on some Christmas cards next! I'm thinking this will look pretty with some blues & snowflake stamps! I was hoping to use the Simon Says November Card Kit for this challenge. Unfortunately the with the postal strike that is on right now my parcel is still sitting at the border. Maybe I'll get it in time for Christmas! So, as I have said before, I have a shopping problem...when I can't craft I shop for supplies that I plan to use eventually! Today is that day, actually the last couple of weeks have been. I am finally getting time to sit in my craft studio and use all the fun things I have been buying over the last several months. 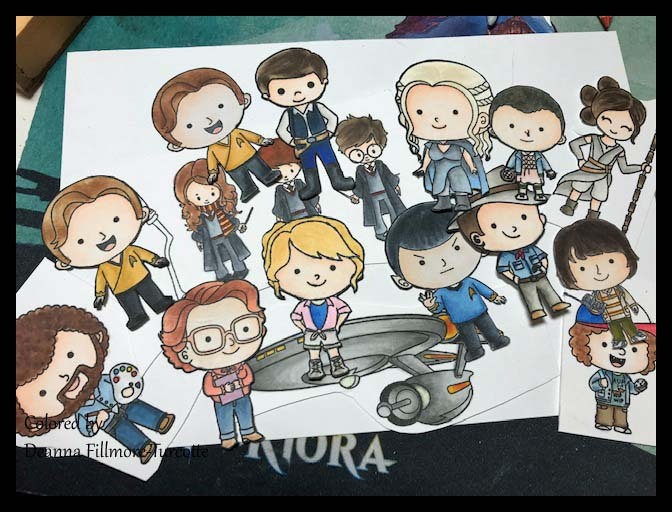 Since I own a comic store, I always look for comic related items and found a ton at Simon Says Stamp with the new dies by Character World. I bought one to star & I liked it so much that I may have bought a few more! 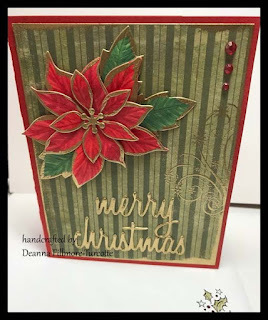 This card is for the Simon Says Stamp Wednesday Challenge Anything Goes! 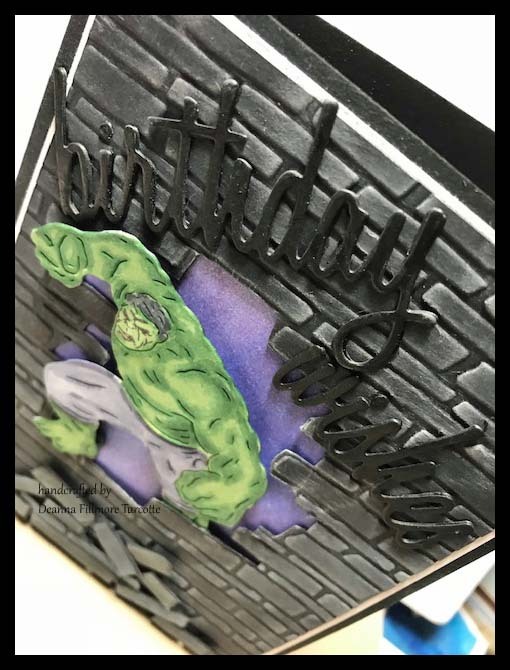 I die cut the hulk using Neenah Classic Crest Solar White and colored him with copic markers (G21, G28, G29, BV20, BV23, BV25, BV29, C5, C7, C9 & R02) the die comes with a face stamp and that was the hardest part, thank goodness for my Misti or I may never have lined that up properly😀. I really wanted to have the Hulk bursting through the wall so I used the Spellbinders M-Bossabilities Bricks & Bark folder to create the wall and cut a piece out of the middle. I cut some of the bricks up and attached them to the bottom of the card with foam squares. 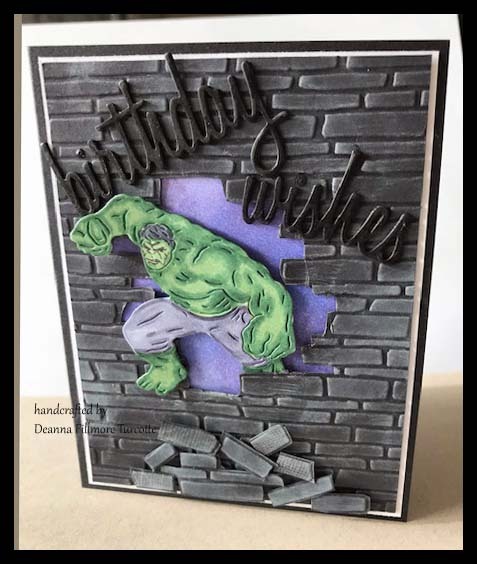 I was going for a messy look from the chaos of the wall being destroyed and put everything at angles even the greeting (Sizzix Tim Holtz Alterations Thinlits Celebrate die set). 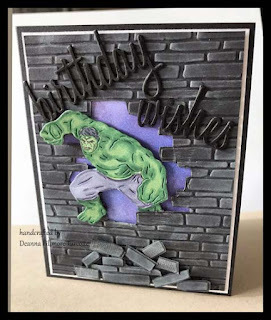 The wall and greeting were cut out of black card stock, I distressed the wall & bricks with white & grey chalk inks and colored the greeting (triple stacked) with a black wink of stella pen. I glued the one leg that is behind the wall flat and then used foam dots to adhere the Hulk in place. I'm really quite happy with how this turned out and will definitely make more of this card! I shall be back soon with another project. 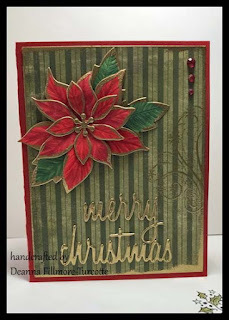 This is my entry for the Simon Says Stamp Monday Challenge blog. 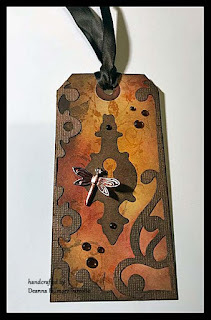 This weeks challenge was Take Flight and I decided to make another tag and use this cute little dragonfly embellishment that I've had floating around my craft studio for years! 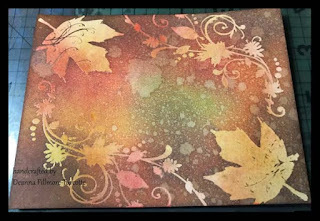 I started with a plain tag and colored the background with Tim Holtz distress inks (wild honey, tea dye, fired brick, vintage photo & walnut stain), and used the wild honey & vintage photo to stamp the leaves (Inkadinkado fall season stamp set) on the tag. 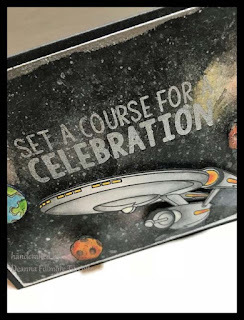 The die cut elements are from the Tim Holtz alterations hardware findings die and I sponged them with vintage photo, walnut stain & Brilliance cosmic copper inks. I sliced the one die down the middle and used it to edge each side of the tag. As I mentioned earlier the little dragonfly has been in my stash for years and I put a few drops of red alcohol ink on it to get it to blend with the colors in the tag a little more. It still needed a little something so I adhered a few rhinestones to add a little more detail. Well, now I have to go clean up the mess I made, don't think I'm ever going to get the red alcohol ink out of my jeans but oh well! Must remember to put on the old clothes before I start working in my studio, LOL! Thanks for stopping by and happy crafting everyone! 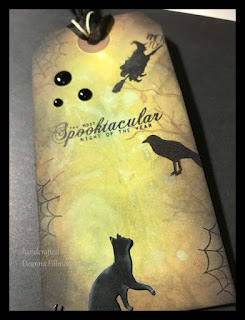 Another Halloween project, this time for the Simon Says Stamp Wednesday Challenge! I decided to try a few new techniques working with distress oxide inks and water. It worked out really well but hard to tell in the pictures. 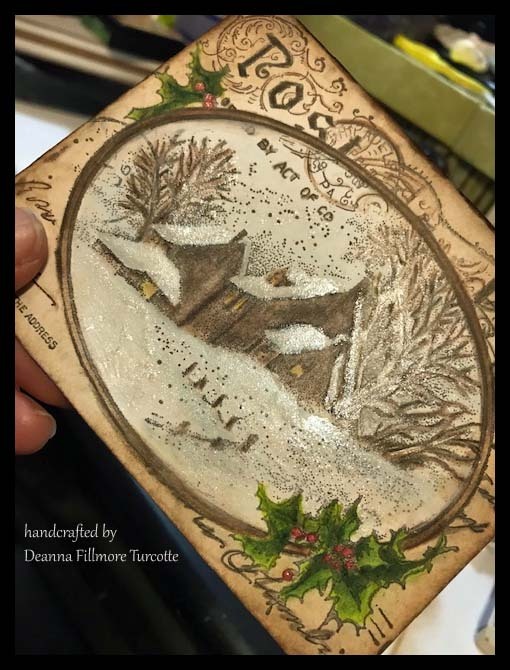 I started by blending peeled paint and walnut stain oxide inks on the tag and then lifting the color using a tree stamp and water (that is what doesn't show up to well in the pictures). I also stamped the tree on the edge of the tag with vintage photo distress ink and edged the tag with walnut stain and black soot distress inks. The tree stamp is from and old Basic Grey Halloween "Spooky" stamp set that is one of my favorites and I dig it out every Halloween. 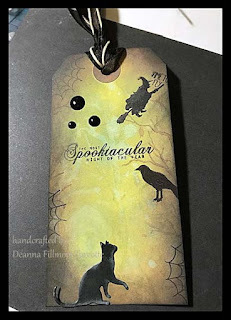 The other stamps are from a couple of sets by My Mind's Eye "Happy Haunting" & "Lost & Found Halloween". 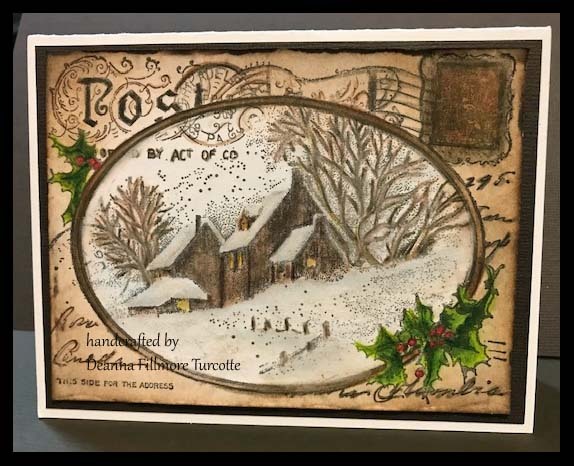 I stamped the images & greeting with black archival ink and added a few enamel dots (also from My Mind's Eye). The little cat was made using the Poppy Stamps curious cat die and then used an assortment of ribbons & string on the top. This is a quick post that I will fix up tomorrow or the next day, I will add more details about the products I used for this. It is late Sunday night and I have been at work for over 14 hours today and I really want to get this posted for the Simon Says Monday Challenge before time runs out. Spider Web - Memory Box "Haunted Web"
Fence - Tim Holtz Alterations "On the Fence"
Cat - Poppy Stamps "Curious Cat"
For the interior panel I started with white card stock and masked off the moon, then used Distress Inks to create the background (tumbled glass, broken china, blueprint sketch & black soot). Colored the moon with PrismaColor pencils Canary Yellow, White and Derwent watercolor pencil Deep Cadmium). Tree is from the stamp set "Spooky" by Basic Grey (one of my go to stamp sets at Halloween, I've had this set for almost ten years), added a bunch of highlights to the trees, sky and ground using prismacolor white & cool grey 20% pencils. I popped the house (Memory Box -Country House) up using foam squares.